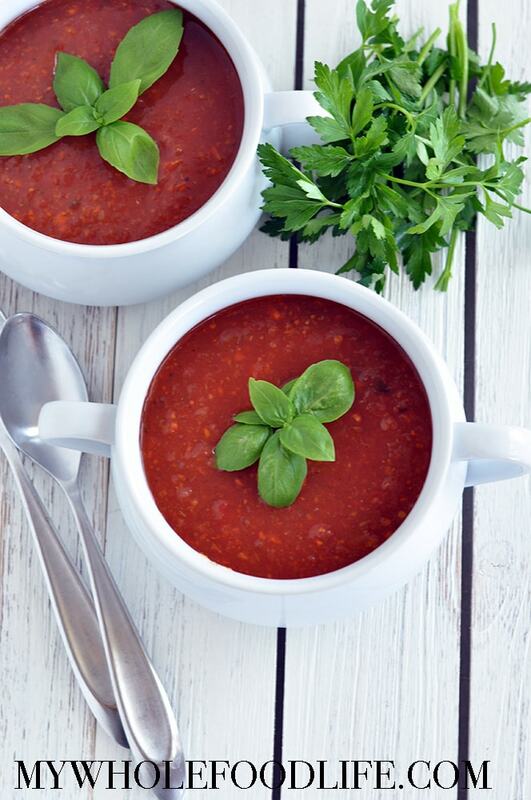 Rustic Tomato Soup. I love tomato soup. I used to be a huge fan of the kind in the can. I had never attempted my own tomato soup before until now. It came out really good. I always thought soup was one of the harder meals to make, but really, it is so easy. You simply just throw everything in the pot and walk away. Now that is my idea of cooking! I even chopped up all the veggies in the food processor instead of hand dicing them. I made mine on the stove, but it would be extra good in the crock pot too! We just have a small crock pot and I wanted to make a good amount of soup so I could freeze some. Throw everything in a pot and cook on low covered for at least 2 hours. I like to cook mine longer. The longer it cooks, the more the flavors develop. Uncover and add a bit of flour to thicken. I use brown rice flour. Serve immediately or refrigerate for later. Hope you like it as much as we did. do you know how much basil and parsley you would substitute if you were using dried? Thanks! Maybe 2 tsp basil and 1 T parsely. 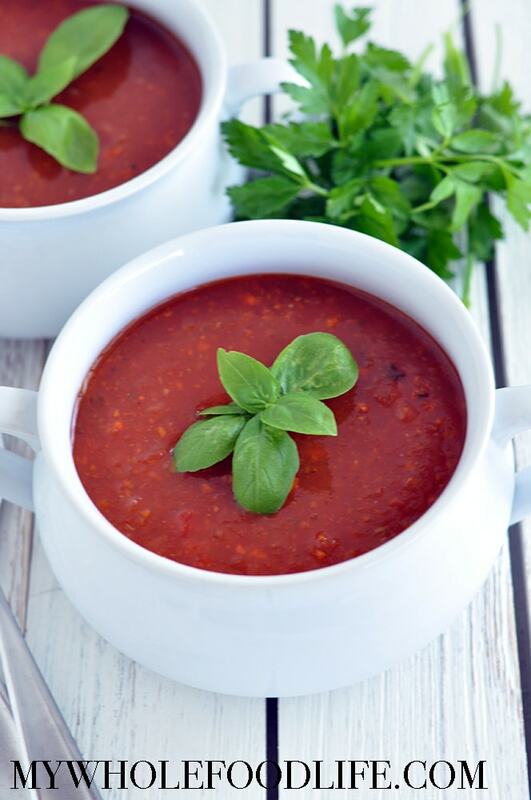 I LOVE tomato soup and have made several similar recipes and always need a sweetener of sorts to offset acidity of tomatoes (and other than tomato recipes, I do not use sugar/ sweeteners in my cooking and do not have a sweet tooth whatsoever). Have tried adding roasted red bell peppers and this was my most successful recipe, still needed just a little something to cut the above mentioned acidity. Anyhow... I guess my question is - how "smooth" tasting is this recipe? Did you use any specific type of tomatoes? I subscribe to cooks illustrated website and found a good recipe for tomato soup. It calls for brown sugar and I was thinking about trying to use organic coconut sugar in its place. What's your take on that? Thank you for all you do!! This recipe is mildly smooth, but does retain a bit of chunkiness. You can use an immersion blender to smooth it out if you want. I think adding a touch of coconut sugar sounds like a great addition. What would you recommend if you wanted to cook this in a crockpot? Throw everything in and cook for at least 3 hours on high, or 8 hours on low. This is the first recipe of yours I have tried and the first time making tomato soup. So easy and delicious. And no sugar needed! I blended mine to make a smooth soup. Yummy!!! After cooking, I added a can of whole coconut milk and puréed - yummy! Thanks for the recipe! Oh yum! I am trying that next time! Hey Melissa, I am going to be making your minestrone, split pea and a tomato soup this weekend. My 14yr old is having all his wisdom teeth removed. He use to LOVE tomato soup like you noted on both your tomato soup recipes. I bought him a pacific brand organic one but the milk in it made him doubled over in teary eyed pain. So of course you are my go to! This one doesn't appear smooth like the other one (carrot tomato.) I'm looking to perhaps alter either one to have no chunks for the first couple days and I'm not sure if the carrots in the other one makes it sweet. I also don't want to buy arrow root right now as we are relocating soon. Could this one be somehow made smoother? Thank you for your time. I think you could probably use an immersion blender to blend this. Maybe add a little coconut milk for a creamy factor? I can't see the above posts to know what has previously been commented about.